Looking back at the first edition of Washington Post political newsletter The Daily 202, which celebrates one year of life today, you notice there are so many more names in the running of the presidential nominees. But the name that is missing from that June 10, 2015 inaugural edition is the one that, a short time later, would come to occupy every media space like a noxious, expanding gas. 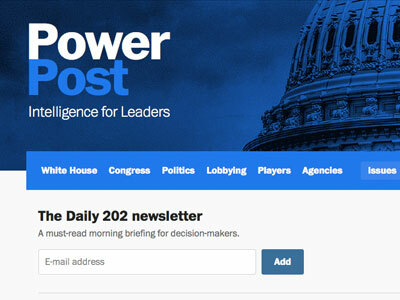 The Daily 202 debuted one year ago this morning. For the launch, I interviewed several of the leading presidential candidates at the time about what they’d prioritize in their first 100 days – if they won. An adviser to Trump telephoned to say that the businessman was announcing his campaign the following week and would love to be included. I declined his request, explaining that we were only writing about the serious contenders because the field was so big. As Rick Perry, whom I did interview for the project, once said: Oops. But really, who among us could anticipate what we were all about to be in for?